Christian leader Sobhy Makhoul speaks of clashes between Israeli factions and parties fighting each other. 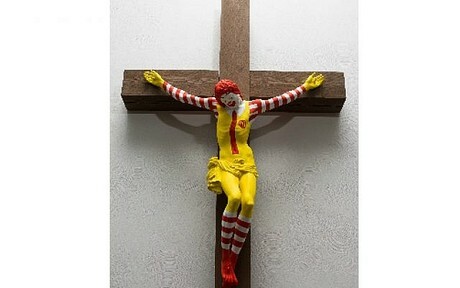 An exhibition with a work that depicts the Ronald McDonald crucified like Jesus. The leaders of the Churches of Jerusalem ask for "respect" and renew the invitation to promote tolerance. Jerusalem (AsiaNews) - In the controversy that has broken out in Israel around the display of offensive works of Christ and the Virgin "there is an internal struggle between the various factions that are competing for power". A clash that, today, is consumed "on the skin of Christians" says Sobhy Makhoul, of the Maronite Church of Jerusalem and administrator of the Christian Media Center. Commenting on the controversial affair concerning the exhibition of "blasphemous" works in the museum in Haifa, he tells AsiaNews "it is right to defend our faith and its most cherished symbols, without exasperating the tone of the controversy". The exhibition, underlines Sobhy Makhoul, "has been open since August, and only in recent days has the controversy erupted. The Minister for Culture and Sport intervened on the matter, attacking the leaders of the Haifa municipality saying that such an exhibition is not acceptable. From the municipality, which is of a different political color, they rejected the criticism, but it is clear that there are contrasts between exponents of Israeli politics with Christians being used as pawns". 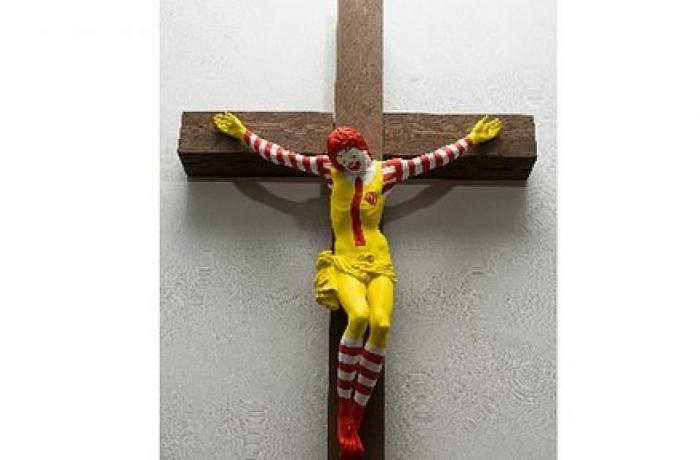 The controversy surrounds a work depicting Ronald Mcdonald, the clown symbol of the homonymous international fast-food chain, nailed to a wooden cross, the work of the Finnish (Christian) artist Jani Leinonen. In recent days, hundreds of people have protested at the entrances of the Haifa art museum in northern Israel, where the exhibition "Sacred goods" is taking place. The demonstrations have degenerated into clashes with law enforcement agencies and throwing stones - and paper bombs - against the entrances. The Patriarchs and Heads of the Churches of Jerusalem also intervened on the matter and, in an official note, condemned the display of "provocative and irresponsible" images. An exhibition that wants to criticize consumerism, they add, but that to do so uses "the most sacred figures and symbols" of the Christian tradition and this is "unacceptable". Aware of the "respect" of the basic elements of the faith, Christian leaders warn that such events "do not help" the three great monotheistic faiths "in their mission of promoting tolerance, conviviality and coexistence" in a particular reality which is the Holy Land. In addition to the Christ version of McDonald there is also a bloody Jesus and Virgin Mary made with dolls. Museum director Nissim Tal says he is surprised by the delayed controversy, just a few weeks ahead of the closure. The opinion of the Israeli minister of culture Miri Regev is different, accused in the past of censorship of art, who hopes for its removal because it is "disrespectful". Others who claim to defend freedom of expression reject this proposal. According to some there is also the fact that such works, considered "taboo", would never have been exposed if they had struck Muslim or Jewish religious sentiments. In contrast, towards Christians - over 175 thousand in Israel alone - there is less attention. "There are elements - says Sobhy Makhoul - that are interested in stirring the waters. We Christians, starting from the balanced declaration of the leaders of the Churches of Jerusalem, must dampen the controversy by avoiding exasperation ". "In these days - adds the Christian leader - I met the community of Haifa, priests and faithful, and there is displeasure about the affair. Of course, the works of art hurt, also because here in the Middle East, in the Holy Land, there is a different sensitivity than in Europe. And the municipality should have been more sensitive to the issue. That said - he concludes - none of us wants to create a problem".